Leading industries include agriculture, manufacturing (transportation equipment, machinery, and electronic equipment,) biotechnology, aerospace-defense, and tourism. Principal natural resources include timber, petroleum, cement, and natural gas. 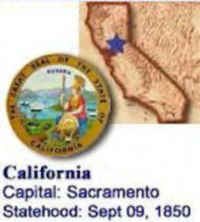 California industrial activity has expanded rapidly in the 20th century along with an expanding population. It has the largest economy of any US state, and was the leading producer by value of both agricultural and manufactured goods. Presidential Birthplace Richard Milhous Nixon was born in Yorba Linda on January 9, 1913 (he was the 37th US President, serving from 1969 to 1974). California's climate is often compared to that of the Mediterranean, due to warm, dry summers, and mild, wet winters. On the coast, average yearly temperatures range between the low 40s°F (4.4°C) and in the high 70s°F (21.1°C) and 80s°F (26.7°C). 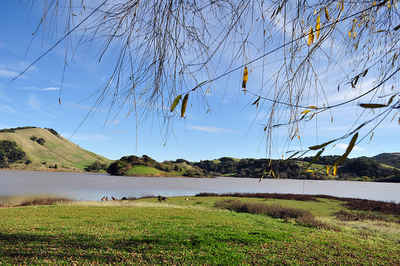 Farther inland, summers are hot and dry, and at higher altitudes the weather is more typical of a four-seasons cycle with cold, snowy winters. The contrast is clear in two of the state's largest cities, where you'll find very different weather patterns. San Francisco is famous for its fog - especially in the summer, and Los Angeles is known for its consistently sunny, desert-like, coastal climate. From Eureka to San Diego, California's large and small coastal cities are not to be missed (especially Monterey, San Francisco and Santa Barbara); Colorado River; Big Sur region; Lake Tahoe; Redwood National Park; the Wine Country (Napa area); Santa Catalina Island; Hollywood; the Golden Gate Bridge; San Simeon State Park; Point Reyes National Seashore; and Yosemite National Park. Death Valley, in the southeast, is 282 ft. below sea level, the lowest point in the nation. Mt. 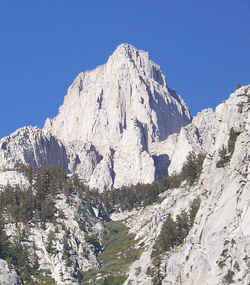 Whitney (14,491 ft.) is the highest point in the contiguous 48 states. Lassen Peak is one of two active US volcanoes outside of Alaska and Hawaii; its last eruptions were recorded in 1917. Total Area 163,695.57 sq. mi. Land Area 155,959.34 sq. mi. Water Area 7,736.23 sq. mi.